This customer will not get a refund on her package bee cage. Bad Girl. The picture above was sent to me. The question was are these swarm cells? 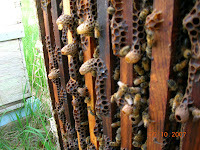 The bees build this brood comb on the bottom of frames. 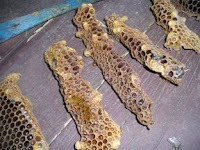 It is drone brood comb. The picture shows drone capped larve that looks like the tip of a bullet. They are not swarm cells. I checked my hives today. I had a few dead ones show up from late season starvation. 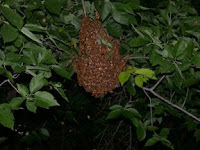 A colony in one yard was crowded with bees but it has a brood disease. I always look at the larvae, I am looking for a nice glistening white color. When I looked at this one frame I new there was trouble. The larvae was a dark mustard color. It didn't rope when I punctured the larvae with a twig, the American Foulbrood test. The larvae that was dead was curled off center in the cell. I think it is European Foulbrood. 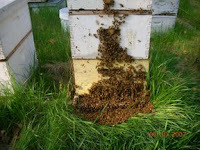 Now is the time to put Terramycin on the hive. 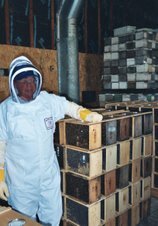 I had a few hives that had swarm cells. Some were so overcrowded that they were hanging out side in mass quantities. I went through the hive and cut out the swarm cells. One hive had twenty cells. I hope I didn't miss any. I saw eggs in the hive so I am assuming the queen is still present. If I come back in four days to divide it and I see queen cells on the sides of the frames and no eggs, I will know that they have swarmed. Had I not dealt with the swarm cells, the hive was set for departure. With the swarm goes all my honey for this year off this hive. It was warm today and bees will hang out the front of the hive on hot days. In this case they aren't likely to swarm, they are just hot. Today though I new they were overcrowded. It was funny, the most crowded hive had very few bees inside. I am sure by later this evening they will be back inside as it cools off.